In the author’s second work, after Al Capone Does My Shirts, I had to wonder if the new book would be as entertaining as the first. Thankfully, it was. This is the story of Kirsten and Walk (short for Walker). Walk has just started a preppy, expensive new school where he is the scholarship student. Kirsten is a rich girl who has just gained tons of weight and seems to have lost her best friend. Kirsten is white and Walk is black. Their worlds are in turmoil, and they end up becoming friends. This story has a major surprise that really looks at what it means to be a family. The book switches off perspectives between Walk and Kirsten, giving you the varying sides of what life is like for these two middle schoolers. Though Walk and Kirsten are the main characters, and it is their stories that intertwine, there are other characters who impact and change their lives as well including Walk’s cousin and Kirsten’s cute younger sister. The characters are richly drawn and see about ready to jump off the page. I can’t wait to see what Gennifer dishes out next. All her tales get to the heart of people and allow you to see life through their eyes (which may sometimes be a little like yours). Would you want to be friends with an 11 year old genius who was going to be a senior in high school and was taking a college class in the summer? Maybe not. So you’ll understand why Millicent hid her genius qualities from Emily, the new girl in town. The volleyball class they both hated gave them something in common and Millicent finally had a friend. The fact that it was based on a few lies leads to some funny situations particularly involving Stanford, the boy Millicent has to tutor. After you read about Millicent you’ll want to read more about Stanford in “Stanford Wong Flunks Big-time” and more about Emily in “So Totally Emily Ebers”. Enjoy! This is a wonderful book that follows the stories of four generations of a Louisiana family. It all starts and ends with Rose, who eventually becomes the matriarch of the family. The stories of members of each generation of Rose’s family, starting in 1939 and ending in present day, are woven together through the books they love. Libraries also play an important part in the story, especially the bookmobile, which Rose drives as a young woman. The stories pull you in and make you want to find out what happens to these people. Just as in life, some stories are happy and some sad. I was really surprised by this story, which was both intriguing and touching. It was a really good read! This book became an instant favorite of mine once I read the last page. Although this story is primarily about teddy bears, one of my favorite animals is featured in it. The rhyming text, which is a bit forced at times, describes children and the unique characteristics of the bears they love. One child feels a bit left out at first, but soon realizes that he has something just as special – a monkey! 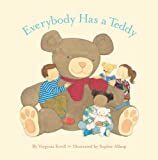 This is a good story to read before show and tell of favorite stuffed animals or to share with a child who loves monkeys or something other than a bear. Moxy Maxwell had just one thing she had to do sometime during the summer before 4th grade. She needed to complete her reading assignment of the book Stuart Little. Moxy loves to read, but not when someone else tells her what to read. Thus begins her problem. She has carried Stuart Little with her everywhere during the summer, but has not managed to read a single page. Now, it is the last day of summer and Moxy has been told, in no uncertain terms, by her mother that she had better spend the afternoon in her room reading Stuart Little or she won’t be able to attend the Summer Splash party. Moxie intends to read, she really does, but suddenly her room needs cleaning, she needs to be outside resting in the hammock and her inspirational idea to plant a peach orchard must be set in motion. Only disaster can follow. This is an entertaining and humorous story of procrastination. Maybe some of us can even identify with Moxie. Be sure to read this to find out if Moxie finally buckles down with Stuart Little. Mr. Pandolfo was old and feeling badly. He disliked his cousins, the Buffalonis, who wanted to take his land, build factories and ruin the streams. So Mr. Pandolfo made a scarecrow and tucked a letter into his insides, and said, “Now you remember what your job is, and remember where you belong. Be courteous, and be brave, and be honorable, and be kind. And the best of blooming luck.” One night there was a tremendous thunderstorm and the scarecrow was struck by lightning and came to life. A young orphan boy named Jack heard him calling for help and took him down and accepted his offer to be the scarecrow’s servant. So they set off on an adventure together and Mr. Pandolfo’s blessing came true for the scarecrow was brave and courteous. Jack was very impressed with Mr. Scarecrow except that he tended to get overly excited and didn’t always understand situations. The scarecrow was indeed lucky because Jack was an excellent servant and friend and quite clever about getting Mr. Scarecrow out of trouble. On their travels they frighten robbers, they become part of an acting troupe with hilarious results, they go to war, and they encounter talking birds. Eventually they must also deal with the law and the Buffalonis. The situations and the dialogue are very amusing and the scarecrow and his servant are a charming pair. They face adversity together bravely and overcome all obstacles in the end. This is a good read for boys and girls in 4th through 6th grades. My daughter and I were both sniffling at the end of this story. A little boy has a toy boat that he made and they do everything together. The toy boat is sailed by the little boy on a string, and the boat would like to know what it would be like to be a big sailboat, like the ones he always sees. Then, when a storm is coming, the boy’s mother pulls her son to come in, and the boy drops the string. The toy boat drifts off into the lake. He drifts by “real” boats and they all have angry “faces” on them, and keep telling the toy boat to “Move along!” He feels so small and hopeless. The boat is out in the middle, and practically capsizes, but in the morning, a beat-up old fishing boat helps move the water and the toy boat back to shore. Miraculously, the boy is out at the shore wondering about his toy boat, when he sees the boat and gets it back! The page with the boat looking forlorn with water dripping off of it so it looks like tears really got to my daughter (and me). Girls will like this story as much as boys.